It’s no secret that Jean Kilbourne is an influence on my perspective and my work (I cite her here, here, here, here and here). She is a pioneer and an icon to scholars and activists committed to promoting media literacy. I was first introduced to Kilbourne’s work in 2001 with the 3rd and most recent installment (at the time) of her legendary lecture on images of women in advertising, Killing Us Softly 3. Coupling wit and sass with an eye-opening examination of taken-for-granted themes in advertising, Kilbourne helped me develop a more critical and analytical eye. I was truly changed and continued to show that film every semester for the next 9 years. After nearly a decade, I can recite every line from her film and am less surprised (but no less outraged by) by the disturbing, and often horrific images created by ad execs and other media makers. But the film is no less relevant or important and, sadly, the images she deconstructs have remained fairly unchanged. Every semester, my new crop of students continue to be shocked awake by her film, the blinder peeled away. Her words and the images she discusses continue to be important and meaningful despite the 4 decades that she has spent discussing this topic. After all, not much has changed. This is why I am so happy that Kilbourne and the Media Education Foundation have released an updated version, Killing Us Softly 4. 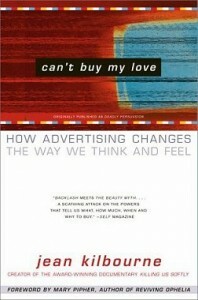 For more on the themes and patterns mentioned in her series of films, read Kilbourne’s book Can’t But My Love: How Advertising Changes the Way We Think and Feel. Hey, thanks for the various shout-outs to Women In Media & News and to our blog, WIMN’s Voices, via the links in this post. Kilbourne is, indeed, a pioneer, an icon and a visionary. Completely formative to my development as a media critic. I was first introduced to her work in the early 1990s when I was first studying media in college. Ah, just a little green that you found her so early and were interviewing her by the time I was first introduced to her work (I can’t believe I didn’t find her earlier. I mean, I went to Z Media Institute in 1997!). I’m going to edit this post and add this link. Shoot, Kilbourne isn’t just my idol…you are, too. What a true inspiration you are. I’m thrilled to know you. Oh, Melanie, that’s so humbling. Thank you.